Most airlines, in trying to mitigate the impact of fuel price volatility, have resorted to stringent baggage restrictions as part of measures to achieve better fuel efficiency. According to the International Air Transport Association (IATA), every 1% improvement in fuel efficiency across the aviation industry can lower fuel costs by US$700mil annually. This is unsurprising since fuel cost is the second-largest cost for airlines after labour. Passengers on AirAsia flights are encouraged to travel light, like using carry-on luggage, to minimise checked-in baggage. They are allowed to have one carry-on luggage of up to 7kg, plus free 15kg allowance for checked-in baggage. 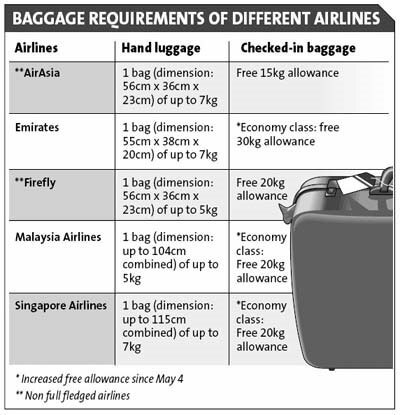 In comparison, Malaysia Airlines (MAS) allows for hand luggage to have a maximum combined weight of 5kg and free 20kg allowance for checked-in luggage for economy class (see table). MAS general manager for corporate safety, security, health and environment, Ooi Teong Siew, said reducing weight was one of the static techniques, which include ensuring aircraft are well trimmed and engines cleaned regularly. Dynamic techniques, meanwhile, are factors that have an impact on the flight path like direct routings, economical speeds, continuous descents and optimum altitudes. "These efforts, without compromising on safety and quality, have reduced our fuel burnt rate and enabled us to contribute to cost reduction of RM2.3bil from 2006 to 2008," Ooi said in an e-mail reply to StarBiz. AirAsia Bhd group chief executive officer Datuk Seri Tony Fernandes noted that for every flight hour, an additional 1,000kg of take-off weight would burn up 90kg fuel. AirAsia also achieved greater fuel efficiency with its new fleet of A320 planes, as they offered higher unit fuel consumption per flight while high dispatch ability and operational efficiency contributed to lower maintenance expenses, Fernandes said. "We adhere to a quick turnaround of 25 minutes, which leads to high aircraft utilisation, lower costs as well as greater airline and staff productivity. Fuel consumption-wise, the quick turnaround means less time spent by an aircraft idling on the ground, which reduces unnecessary fuel consumption and harmful emissions," he said. Such practices kept costs down and ensured minimum aircraft weight, Fernandes said, adding that savings and benefits would translate into low fares for passengers. Ooi said MAS also minimised the use of auxiliary power unit on ground, ensured faster connection of ground power, chose the best flight profile as well as adopted a continuous descent approach at applicable airports, and regular airframe and engine maintenance. "Other examples include replacing the heavy unit loading devices with those which are 40kg lighter and using nearer alternate airports." MAS is anticipated to achieve greater fuel efficiency when it takes delivery of 35 B738 late next year and the A380 in 2011. Meanwhile, FlyFirefly Sdn Bhd managing director Eddy Leong said the airline did not practise overzealous efforts in enforcing one hand luggage and checked baggage limits. "Firefly's business model was designed to be light from the beginning because we chose a very fuel efficient and modern ATR72-500 aircraft," he said. The focus then is on eliminating hassles, enriching the travel experience and optimising costs. "For example, our full complimentary food and beverage on board includes serving muffins on paper cups and ensuring that we cater exactly to the passenger count. Any extras would be given to passengers. "In the end, there is no waste to offload, no wastage to worry about. Our ultimate gain is in the revenue side and loyalty from passengers," Leong added. Emirates Airlines, in contrast, increased the free baggage allowance across its network effective May 4, with the exception of countries that apply one-piece concept for checked-in luggage. Economy class travellers are now given 30kg from 20kg previously. An analyst with a local brokerage said the impact of strict baggage terms was unlikely to have a huge impact on bottomline. Airlines also tried to carry the correct amount of jetfuel and to power planes by ground power units during waiting periods instead of jetfuel to achieve better fuel efficiency, he said. IATA, on its website, indicated efforts being taken with air navigation service providers, air traffic controllers, airlines and other key stakeholders to save one minute per flight via better airspace design, procedures and management. "If successful, this initiative could reduce total industry operating costs by over US$1bil a year and significantly reduce environmental emissions," the association said, noting that on average, airlines spent US$100 per minute per flight in total operating costs.